In A Divine Revelation of Heaven, after thirty nights in which God gave her visions of the depths of hell and the punishments of the lost, Mary K. Baxter was shown for ten nights the glories of heaventhe home of redeemed souls. 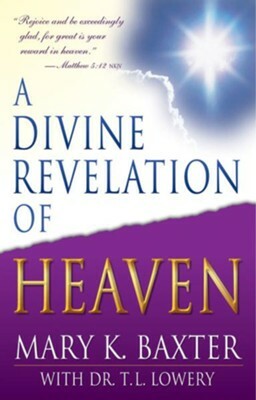 Included in this book are her depictions of heavens gates, angels, music, worship, storehouses of blessings, joyful heavenly citizens, four living creatures, and brilliant throne of God. Mary also describes heavens perfect order and purpose, what happens to children, and much more. These breathtaking glimpses of heaven, interspersed with applicable Bible verses, will turn your heart toward the beauty and joy that await every believer in Christ. Mary K. Baxter is an international evangelist. In 1976, she received visions of hell and heavenrevelations of warning and of salvation that she has since recorded in her books. From her Florida-based ministry, she ministers around the world, and many miracles have occurred in her services. 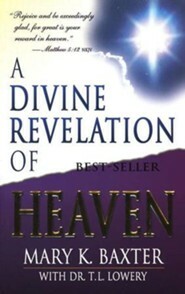 Mary Baxters book A Divine Revelation of Hell has sold more than 1.4 million copies. 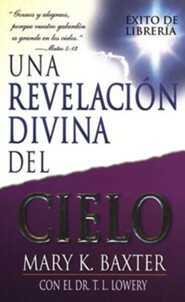 In addition to that work, her books published by Whitaker House include A Divine Revelation of Heaven, A Divine Revelation of the Spirit Realm, A Divine Revelation of Angels, A Divine Revelation of Spiritual Warfare, A Divine Revelation of Deliverance, A Divine Revelation of Healing, A Divine Revelation of Prayer, and A Divine Revelation of the Powerful Blood of Jesus. I'm the author/artist and I want to review A Divine Revelation of Heaven - eBook.